The Mantis Shrimp is also called the stomatopod. They are actually not mantids nor shrimp, but they do resemble both those animals. They usually may reach about a foot in length, although unusual specimens have been noted that were a bit longer. The carapace of a mantis shrimp makes a cover for the head’s back side. They may appear in different colors, from brownish to neon. They are commonly seen in the animal world, and they are among the more important of the predators in the habitats they live in. They can be found in shallow water in sub-tropical and tropical areas. These animals were dubbed “sea locusts” by the Assyrians of ancient times, and in Australia, they are known as “prawn killers”. They have powerful claws, and these can be used to lure, attack, and then kill their prey by stunning, spearing or dismemberment. The breed is sometimes thought to be only a legend, due to rare sightings in some areas. These are made up for by areas with many sightings, however. The mantis shrimp spends its life in a solitary manner but can be aggressive. They can often be found hiding in formations of rock, or burrowing passageways into the sand. They sometimes wait for their prey, as typical crustaceans do, but they are also able to hunt down their prey. They don’t often leave their holes except to eat or relocate. There are about 400 species of the mantis shrimp, and they are usually split into two groups, by the functions of their claws. The Squilla mantis has a spearing appendage, and they have little appendages with tips that are barbed, which they use to snag and then stab their prey. The smashing types possess a more clublike claw which they can utilize to break their meals into more easily manageable pieces. 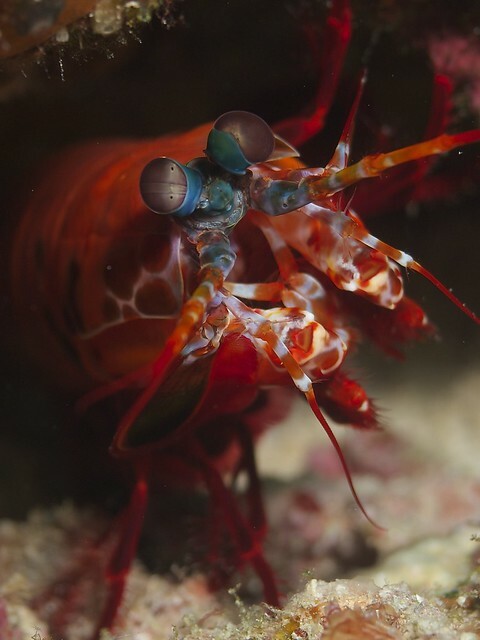 Both types of mantis shrimp strike out at their prey by unfolding and then swinging their claws, and they can inflict damage on their prey even if the prey is bigger than they are. Smashers attack rock oysters, mollusks, crabs and snails, and their clubs allow them to crack their preys’ shells. Spearers often go for the meat that is not hard to get to, like fish. Mantis shrimp live long lives, and they can exhibit behavior considered complex, like ritualized fighting. They can remember neighbors well, and they will defend their own areas from rival species. These mantids may breed as many as twenty or thirty times in their lifetime. The eggs are kept in burrows or carried beneath the female’s tail, emerging when they hatch. In some sub-species, the female and male are together only for mating, while in others, they mate for life.